In December 2018, Glocal Notes posted a preview of two digital projects from IAS graduate assistants Laura Rocco and Mariah Schaefer. The finished projects were presented February 1, 2019, at the library, along with Slavic Reference Service GA Erika Weir’s Scalar collection “Lithuanians in Chicago.” The goal of creating these online tools was to connect patrons with library materials on niche research topics and materials that might otherwise be difficult to locate, as well as to explore publishing platforms that libraries can use to showcase their collections. The fiction exhibit currently showcases 22 works of fiction published by Balai Pustaka. 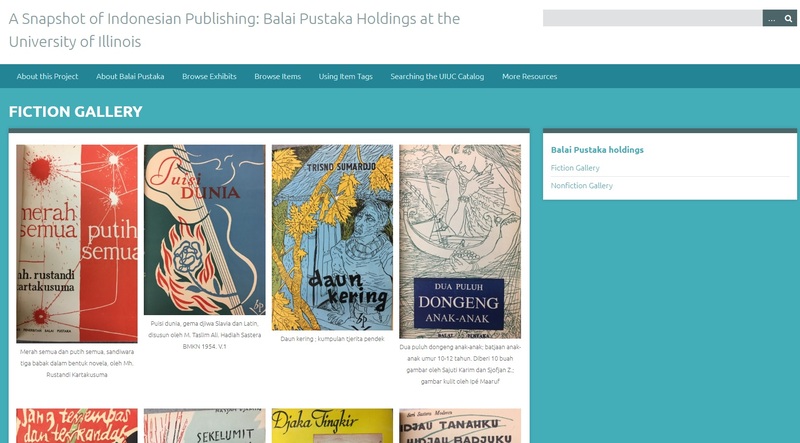 Omeka is a digital publishing platform for creating digital collections and exhibits and is great for projects that are highly visual in nature and centered on “objects.” This digital collection showcases a sample of the Balai Pustaka, post-colonial fiction titles held in the University Library collections. Each item entry includes scans of pages with important bibliographic information – the cover, title page, copyright page, etc. – as well as bibliographic metadata about the item. Users can browse by item, by exhibit, or by tags. There are also links for finding other resources or using the library catalog, which holds over 150 titles from the publisher Balai Pustaka. The overview tab has a map showing where Timor-Leste is located. Library guides are great for showcasing research resources on a specific area and can be divided into several tabs that focus on different topics. This research guide follows that format and presents resources on the country of Timor-Leste, which is located in Southeast Asia. The guide is broken down into an overview tab, a history tab, a languages tab, and a government tab. 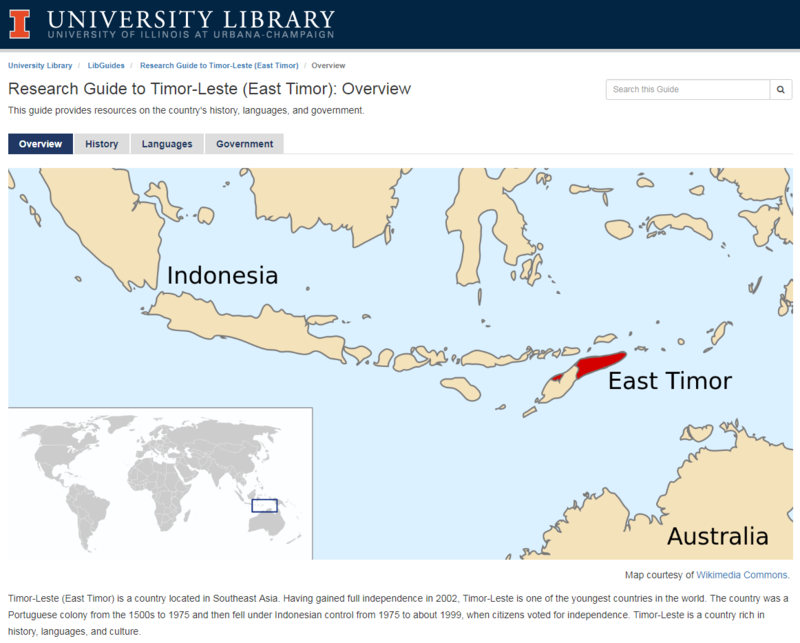 All of the resources listed on the Research Guide to Timor-Leste (East Timor) can be accessed through the University of Illinois Library. This entry was posted in Uncategorized by Laura Marie Rocco. Bookmark the permalink.